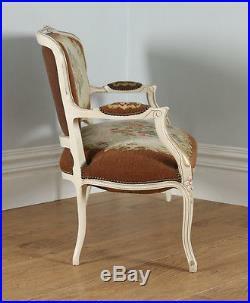 Antique French Louis XV Style Painted Gilt. 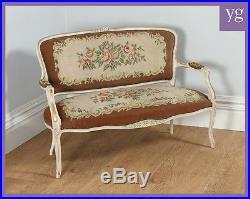 Shabby Chic Carved Upholstered Tapestry Couch / Sofa / Settee (Circa 1910). Here is an example of a good quality antique French Louis XV style carved painted beech and upholstered tapestry couch, circa 1910, in original condition. Please scroll down to view detailed images of this item. 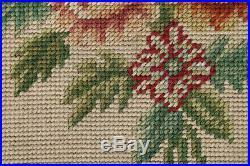 Cream and brown floral pattern. Firm sprung webbed base. Rustic painted gilt frame. Here is a good example of an antique French Louis XV style carved painted beech and upholstered tapestry couch, circa 1910, in original condition. Most likely constructed of solid beech, the couch exhibits a distressed shabby chic finish, with a stunning quality carved and painted gilt floral frame. 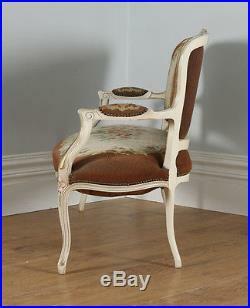 It stands on elegant cabriole legs at the front and splayed feet to the rear. The couch features its original tapestry upholstery including the original brass studwork, depicting floral motifs on a cream and brown background. The couch features open padded arms with shaped sides. The back rail boasts stunning floral carved pediment; the frame also boasts floral carvings to the front of the seat apron and the knees, as well as scroll carving to the arms. 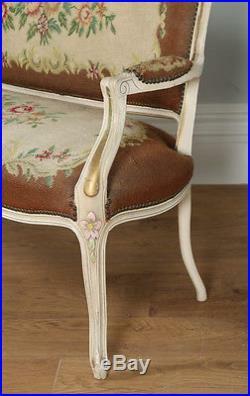 The frame of the couch is painted in an off-white colour, while the floral carvings are picked out in pink and green. The shaped supports to the arms display gilt carving. The seat is well sprung so that you do not sink into the seat. The underside of the seat is finished with traditional webbing. As it boasts the original finish, it has a lovely distressed colour; this can only be achieved through age and years of care and cleaning it has received. 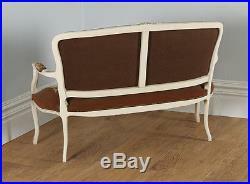 This couch would look superb in a variety of rooms from the living room, hallway, to the bedroom or conservatory. The couch would certainly grace any home and is a great investment as it is extremely functional. So don’t miss out your chance to own a lovely set of furniture. External Height = 89cm or 35 or 2ft 11. External Width = 129cm or 50¾ or 4ft 2¾. External Depth = 61cm or 24 or 2ft. Seat Height = 44.5cm or 17½ or 1ft 5½. Seat Width = 118cm or 46½ or 3ft 10½. Seat Depth = 53cm or 20 or 1ft 8. Arm Height = 61.8cm or 24 or 2ft. Back Height = 47cm or 18½ or 1ft 6½. This couch is in original condition. 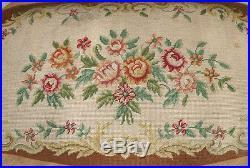 We have cleaned the tapestry with upholstery cleaner. 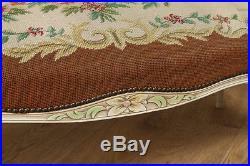 The couch features its original tapestry upholstery with original brass studwork. The upholstery shows signs of general fading, wear and tear and small marks. 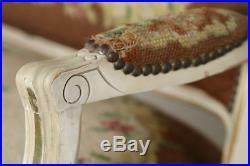 There are also signs of wear to the upholstery on the top of the left hand arm (please see photos). Nominal old use marks are present to the leading edges of the painted frame, but nothing significant, considering the age of the item. Please note, the couch displays a shabby chic finish and as such, the paintwork is worn in places. The seat is well strung and the underside is traditionally webbed. The back and arms are also in good condition with no splits or loose joints, and no missing carvings to the frame. This couch is well constructed, solid in joint overall and is ready to use. Packaging removed & recycled. All items are professionally packaged and fully insured in transit, therefore, we can assure you, your items will be securely protected in transit and arrive safely with you. Before placing your order(s) please make sure this is the item for you. Delisting & Sale Cancellation. CINOA is the world association of Art & Antique dealer associations. All LAPADA & CINOA members abide by their strict code of practice by adhering to reputable standards of quality, expertise and integrity. Yolanda Gray has dealt in fine art and antique furniture for over 40 years. Yolanda Gray has a special interest in Colonial furniture, specifically Colonial Four Poster Beds. Yolanda Gray also provides a variety of fine English Antique Furniture, Art and Fabrics to clients in the UK, Europe and further afield. Please visit the Yolanda Gray website. For further items and information. 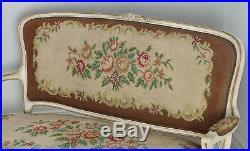 The item “Antique French Louis XV Style Painted Gilt Carved Tapestry Couch Sofa Settee” is in sale since Thursday, December 15, 2016. 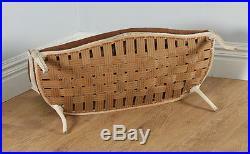 This item is in the category “Antiques\Antique Furniture\Sofas/Chaises\Edwardian (1901-1910)”. The seller is “yolandagrayantiques” and is located in Tarporley, Cheshire. This item can be shipped worldwide.